Loose stool and diarrhea in older dogs… Not exactly a savory topic but nonetheless important! Does your older dog have diarrhea on and off (chronic diarrhea)? What could be the cause? Should you be worried? What can you do if your oldie has a sudden bout of diarrhea? When should you take the dog to the vet? We are going to look at all these questions and more in this post. A study showed that 90 percent of dogs with diarrhea were caused by a problem in the small intestine. In particular, the problem was very often diet-related. The study found that the most common problem in the small intestine was gastroenteritis (inflammation of the intestine/stomach). This problem can be caused by bacteria, viruses, parasites, or even adverse reactions to new foods or medications. And gastroenteritis can cause acute diarrhea (and possibly vomiting) in dogs. In the last 48 hours, has your dog had access to some spoiled foods? A sudden bout of acute diarrhea in dogs may be caused by eating something not quite agreeable with the dog. Things like spoiled food, or even toxic substances. Drinking from dirty water puddles or rivers may also cause acute diarrhea. In the last 48 hours, has your dog been given some new foods? If you have just switched your older dog’s food, or added new ingredients to your home-cooked dog diet, your dog might be having a food intolerance or even allergic reaction to some of the new ingredients. Sometimes, a sudden switch from one food to another (e.g. one brand to another, or one type of food to another, such as from dry to moist) may also cause upset stomach in dogs. Have you given any new medications to your dog in the last 48 hours? If food is not a problem, how about medications? Some drugs cause diarrhea. For example, NSAIDs may have diarrhea as one of their side effects. Some dewormers, most antibiotics, and some heart medicines may also cause diarrhea in dogs. Are there any recent changes that may have caused him stress? Older dogs are more “set in their ways” and can’t adapt to changes too well. Changes could be physical (getting sick for example), or environmental (having a new member in the family, or missing a family member, etc.). These stressors could bring about acute diarrhea in dogs as well. Now, all of the above possible causes could cause sudden bouts of acute diarrhea in dogs. But if your older dog has chronic diarrhea on and off, then most likely the diarrhea is a symptom of an underlying health problem. The bad news is, older dogs are more prone to most of these health problems! Therefore, if your oldie has chronic, intermittent diarrhea for over 2 weeks, be sure to take him to the vet for a thorough check-up to see if the diarrhea is indeed caused by an underlying disease. Don’t wait. For the occasional diarrhea, you may want to try giving your older dog some home remedies first to see if the diarrhea stops. The most important step in treating acute diarrhea is to let the gastrointestinal tract take a holiday. Withhold food for 24 hours, but be sure to encourage the dog to drink as much water as he wants. This Tummy Support remedy contains B-Complex vitamins that help stabilize electrolytes, and nourish the lining of the GI tract. It also has probiotics to re-balance the gut flora and digestive enzymes to break down undigested material for elimination. It works fast to relieve and stop a bout of diarrhea. A must-have in your dog’s first aid kit. If your old dog’s tummy has settled within 24 hours, all is good. You can then feed him some bland, super easy-to-digest food that is low in fat. For example, give 1 part cooked ground turkey with 2 parts cooked rice. Or 1 part cooked 95% lean ground beef with 2 parts cooked oatmeal, etc. Feed your dog 3 to 4 small meals a day for the first 2 days. Then you can slowly switch the diet back to your dog’s regular food. We all know that pure pumpkin puree is a great home remedy for both diarrhea and constipation. Be sure to use 100% pure canned pumpkin puree, not the one for making pumpkin pie. Carob is rich in B vitamins (thiamin, riboflavin, niacin), and minerals (calcium, magnesium and iron). It is very effective in calming an upset tummy and curbing diarrhea. The oil in cinnamon has anti-bacterial and anti-fungal properties. It has long been used in different cultures to treat digestive issues, such as diarrhea, gas, and nausea. OK. We have 3 great food ingredients here for diarrhea. What we can do, is we can combine them to make a diarrhea remedy that’s more powerful! To a cup (about 200 grams) of pumpkin puree, add a teaspoon of carob powder and half a teaspoon of cinnamon. Mix well. Add a tablespoon or two (depending on your dog’s size) of this spiced-up pumpkin puree to your dog’s bland food (like the cooked turkey and rice meal as described above). It not only greatly adds to the taste of the food, but the fiber of pumpkin and the nutrients in carob and cinnamon can also further help calm the stomach. 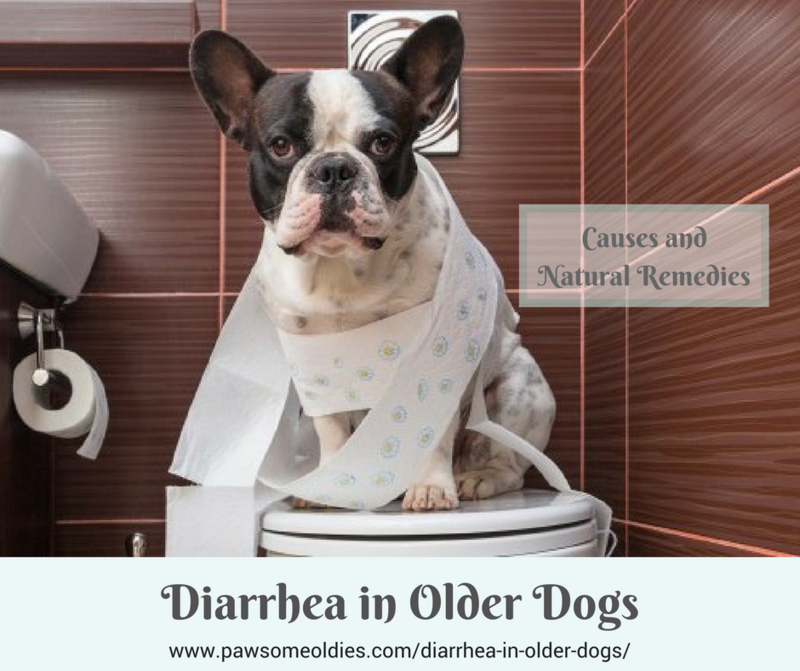 While it is of course not possible to totally prevent diarrhea, but we can do our best to try to minimize the occurrence of diarrhea in older dogs. To keep your older dog’s digestive system in tip-top condition, I highly suggest that you add probiotics and digestive enzymes to your dog’s diet. The good friendly gut bacteria play a vital role in maintaining healthy digestive and immune systems in dogs (and people). If your older dog has a rather sensitive tummy and suffers from diarrhea occasionally, or has loose stool, then there is a possibility that the gut flora in the dog’s gastrointestinal tract is out of balance. Adding probiotics to his diet helps re-balance the gut flora and boost immunity. It is even more important to add probiotics to his diet after a course of antibiotics. Older dogs also tend to have lower production of digestive enzymes. Adding an enzyme supplement to an old dog’s diet helps food digestion and nutrient absorption. This supplement contains not only probiotics and digestive enzymes, it also contains prebiotics that stimulate the growth of friendly gut bacteria (the “good guys”), and further boost immunity. We all agree that regular exercise helps relieve constipation. But does exercise also help relieve and prevent diarrhea? This study found that regular structured exercise helped sedentary dogs with chronic diarrhea rather significantly! So if your older dog is a couch potato, drag him off the couch and start exercising! Brisk walking, swimming, playing simple games such as fetching a tennis ball are all good exercise. The study found that exercising 3 to 5 times a week could bring good results. As stress is one risk factor of diarrhea, it makes sense to let your older dog live a stress-free life as much as possible. Do not make sudden changes to his daily routine or lifestyle, and make sure that he has a comfortable bed and quiet place to rest throughout the day. Boarding an older dog in a kennel can give the dog a lot of stress, so avoid doing that unless it’s absolutely necessary.